The Mizoram NGO Co-ordination Committee comprising YMA, MHIP, MUP, MSU and MZU on Monday decided to observe February 12, 2019 as the ‘Protest day’ and to gather in the premises of Vanapa Hall here to stage protest with black flags against Citizenship Bill. 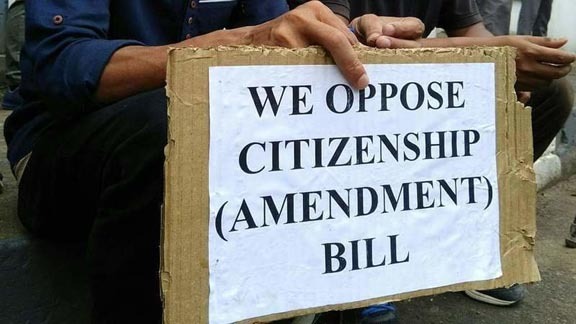 The Mizoram NGO Co-ordination Committee held a meeting on Monday where they discussed the ongoing issue of the Citizenship (Amendment) Bill (CAB). As the Bill has already been passed in the Lok Sabha, the NDA-led central government is likely to introduce the Bill in Rajya Sabha during the ongoing session. The coordination committee has also appealed to all the citizens of the state to gather together with black flags in protest against the CAB. “Though it is of short notice, we are hoping that the people will come together,” said Vanlalruata, CYMA president. In the state capital, the protestors will gather in the premises of Vanapa Hall. “We will also have a mass prayer for the Bill not to be passed in this session,” he added. The NGO Co-ordination Committee met Mizoram chief minister Zoramthanga on Monday to push the central government not to go ahead with CAB to which the chief minister said the same will be discussed in the state cabinet meeting on Tuesday after which they will decide the next course of action. The opposition party, Zoram People’s Movement (ZPM), which has been vocal against the Citizenship (Amendment( Bill, 2016, went one step further on Monday with party general secretary Lalmuanpuia Punte demanding deportation of illegal Chakmas and immigrants before the Bill is passed. The ZPM general secretary also criticised the Mizoram CM saying despite the concerted protests by the NGOs and students’ bodies against CAB, Zoramthanga has not taken any position initiative against the bill which shows that he prioritises his power seat over love for the people and the land. “The MNF is clearly portraying a spirit of disrespect and negligence towards the people by having a linkage with the BJP party despite the BJP’s move towards assimilation of our people and our religion,” said Lalmuanpuia. “If MNF really values its people, we want to request them to leave their NEDA alliance as soon as possible,” he added.